Take a trip back in time as you board vintage railroad coaches restored to their former glory! The Calera & Shelby Railroad runs on a portion of the former L&N Alabama Mineral Railroad, established in 1891. 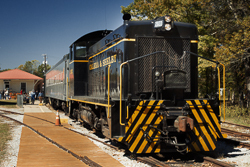 Ride behind a first generation diesel-electric locomotive as you travel through the scenic forests of Shelby County. Upgrade to acaboose or locomotive ticket for a memorable experience and get an up close look at railroad operations! The Calera & Shelby train ride lasts approximately 1 hour. Please arrive 1 hour prior to your departure time to pick up your tickets at the Calera Depot, use the restrooms at the Gift Shop and get in line at your boarding location. Make sure to visit the exhibits in our Depot Museum, our collection of railroad equipment in Clark Yard, our working Signal Garden, and our Gift Shop! Saturdays March 16th - September 28th, 2019 except during special events. Above prices include taxes but not convenience fee. $3.00/ticket purchased on web or $4.00/ticket if purchased through the ticket call center at 205-757-8383 .